try to forced to defrost cycle, if it works (defrost heater) the problem maybe in the controller itself or faulty defrost thermistor. If the controller work properly but defrost heater doesn’t work, perhaps the problem coming from Defrost Heater / Defrost Relay / Defrost Thermo-Fuse or maybe electrical connection faulty. Note: Electrical circuit may vary form different manufacture, so carefully learn it before analyzing. in some fridge, the defrost timer powered directly from main line and it works continous any time, but both wiring above used in many fridge manufacture and it works well. @Ronnie..you’ve lost your bet ! Here is the thing here…Defrost Timer whether 110V or 220 Vac should be supplied with power to make it work. Terminal 3 here should be the line 1 connected to the red line wire here of the defrost timer motor and also the common terminal for compressor (terminal 4) and heater (terminal 2). Terminal 1 will be the Line 2. In this diagram, where is the supply for your Terminal 1 which should be the Line2? How would the timer work? Now here, if the DT advances to defrost mode (Terminal 3, which is LINE 1, switches to Terminal 2), it will give supply to the terminal 1, which is the LINE 2. How do you think about that sir? Thank you and I will still follow on my experiences and other accurate and reliable source. I just want to clarify above specially the timer, that i had found mistake with due respect in the diagram. The timer here should be powered base on the specs, say 220V or 110V. Thus, terminals 1 and 3,which is the coil of the timer must be supplied with 220V or 110V. But in the schematic diagram above, the defrost timer will not work here because terminal 1 has no supply. Terminal 3 has already a line(red line-L), then terminal 1 should get a line from blue line (N). In the drawing above, you would expect that the terminal 1 would get a supply when the timer gets into defrost mode? Remember that during the defrost mode,terminal 3 will switch to terminal 2 that gives a supply to the heater. Now here, terminal 1 and 3 will share one supply during the defrost mode, which will turn into short circuit, but it will not gonna happen, the defrost timer here will not work because the other terminal has no power (terminal 1). but the coil Timer has tolerance for about 10% for voltage drop. When it coil parallel with the Defrost Heater the voltage drop across Heater is very small, its about 2 volts drop in the Heater so the power supply to the timer coil approx. 218 volt or 108 volts in 110 volts circuit. The Timer still works properly. And when the Defrost Thermo bypass the timer coil, the Defrost Heater will get 220V or 110V and timer coil have no voltage between the two terminal (the Timer stop operation while system defrosted) and continue the time cycle when the Evaporator temperature reach the Defrost Thermo cut-in point/when all the ice form in the evaporator melted). In Saudi Arabia as well..I did repair many 110VAC no-frost Ref. Defrost timer should not stop, It is like a clock which has the defrost mode for 20 to 30 mins and advances then to cooling mode for 6 or 8 minutes, a cycle . When the defrost thermostat opens, it breaks the line going to the heater, then the heater will be off even the defrost mode is still going on. You said the terminal 1 gains power from the blue line of the heater, defrost heater either 110 VAC or 220Vac must be supplied with power both its line 1 and line 2. The heater here has indicated a blue line (say Line1) and black (say line 2, will become red when the timer advances to defrost or to terminal 2), which is correct. Now the problem here is the defrost timer supply my friend. Look at it closely. Here is one thing….if you know the operation of the component such as defrost timer…you will no longer get lost in troubleshooting it and connecting it in a circuit. Anyway, I did post your diagram in the http://www.hvac.com site..And they dont agreed on it…they had corrections or revisions made. First is…the power supply of the timer..terminal 1 is not in the correct tapping…The question is..either japan or american defrost timer..would they have different connections in a circuit? Would they have different operating principles wether supplied 110 or 220Vac? Dont depend too much on wiring diagram…Knowing the operating principle of such thing would be an advantage..cheers folk! Im sorry again..here is the site: http://www.hvacphilippines.com….if you have time…!!! http://www.applianceaid.com/images/sampleSxSdiagram.JPG >>General Electric refrigerator made in America. http://i40.tinypic.com/2h5mnbr.png >>Sharp refrigerator made in Japan. 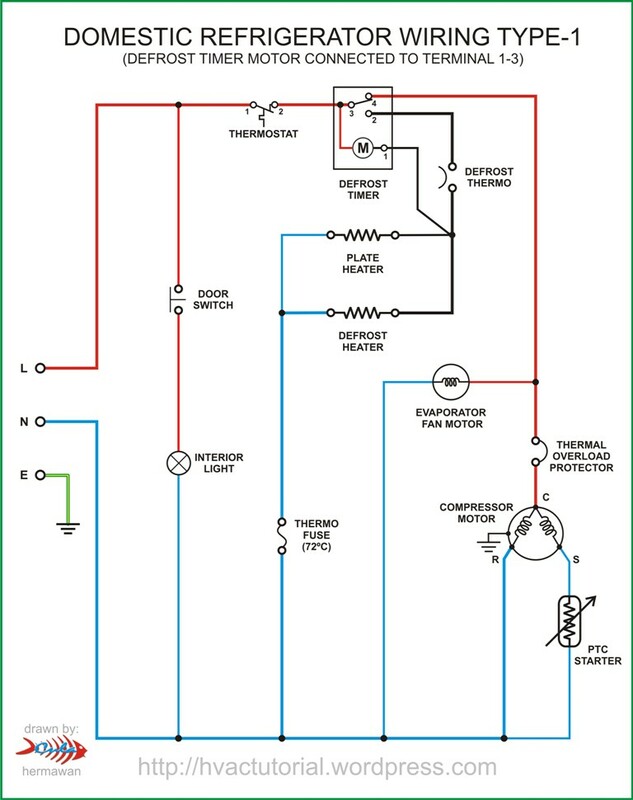 Hi Hermawan – thanks for posting these wiring diagrams. They were quite helpful in figuring out a defrost timer issue. A repairman fixed our refrigerator yesterday. It had been failing to defrost, so he replaced the defrost timer and a defrost thermostat assembly that includes what apparently is a defrost heater fuse. After the repair it seemed to work fine at first, so we paid him and he went on his way. When the frig came to the first defrost cycle, it defrosted for a -long- time. We thought, Ok, good – it’s finally getting rid of all the ice that’s built up. We checked the drain tray and dumped it several times. It kept defrosting. Even when there was nothing more to defrost, it kept defrosting. It was stuck. It wouldn’t come back on. Well, it wasn’t very cold anymore and we had to keep the food from spoiling, so we tinkered with the new defrost timer and found that we could restart the frig by manually turning the timer shaft that sticks out the back. It started getting nice and cold again. So the emergency was over for now – but not wanting to have to do this again every 6 or 7 hours, we needed a better solution. The wiring of this frig is like your type-1 diagram – a General Electric model from Korea. Exactly like it except that it also includes a fuse in series with the defrost heater. The problem turned out to be that when the repairman replaced the thermostat and fuse, he got two wires reversed. Looking at the type-1 diagram, suppose that the wire from terminal 1 of the defrost timer came straight out and connected to the top end of the defrost thermostat rather than the bottom. That’s how this frig was now wired. Looking closely now – as long as the compressor is running, the timer steadily advances, being powered through the defrost heaters. When the timer reaches the defrost cycle, with the flip of a switch it turns off the compressor, turns on the defrost heater, and turns itself off. This state of things remains as long as there’s still ice to defrost. When the defrosting is done, the defrost thermostat opens, turns off the defrost heaters, and if wired correctly as in the type-1 diagram, turns the defrost timer back on. The defrost timer now begins steadily advancing again, and soon switches the compressor back on, and we’re back where we started, in the normal mode of operation. With the wiring error on our frig, most of this still worked the same. The difference was just that once the timer turned itself off, it was off for good, being quite thoroughly shorted out now by the direct connection between terminals 1 & 2, with no intervening defrost thermostat to bring it back to life at the proper time. Now that I understand how the type-1 system operates, I’m quite impressed at its elegance. It will always allow the defrosting job to finish before the compressor is restarted. If a long defrosting job is needed, it will accommodate a long defrosting job. If only a short defrosting job is needed, that’s what it will provide. It does away with the inefficiencies of having to sit and wait after the defrosting job is done, waiting for the defrost timer to finish counting out some predetermined interval of time before the compressor can be started again. That’s right the problem came from miss wired on the terminal no 1. It will run for a single cycle then stop all the time. I have a problem with my fridge. Deep freezer is normal but the other compartment is not getting cooled. Fan operates with the door switch. The problem was the defrost timer. I manually turned it and now the fridge is working properly. Am an engineer n I need a follow up. temperature will colder than normal because the compressor continuous run until the defrost time reaches. for a long time, the liquid refrigerant will entering the compressor and damage the mechanical inside. My Mitsubishi refrigerator is not cooling. When I opened the rear wall inside the freezer section, I found two thermostats…..both rectangular shaped sealed in a plastic pouch. 2. The other showing continuity at room temperature but no change after I immersed in ice water. What is this second thermostat for? 3. The heater is also okay. 4. I also found a small plastic cylindrical sensor-looking thing with two thin white wires. It is connected with the main connector having wires from the fan, heater and thermostats. What is it and what is it for? It bears a number “T2312”. 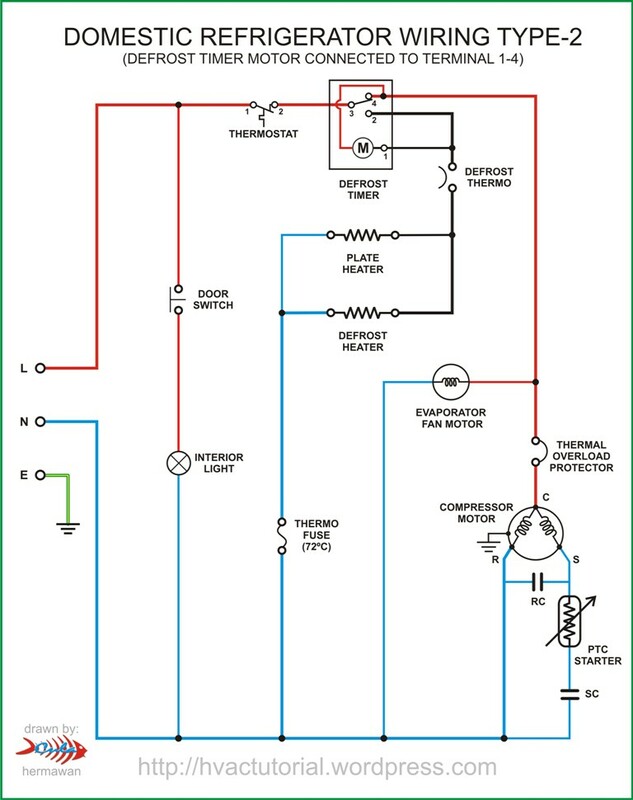 please tell me where is the point incorrect circuit diagram? Very clear explanation. Helped me understand my fridge’s circuit diagram. The defrost timer wasn’t advancing. Several techicians replaced the timer without any effect. With the help of your explanation I traced the fault to the thermo fuse. I replaced it and voila the timer has started to advance! Now keeping my fingers crossed that the evaporater won’t ice up again..